To access the iEARN Collaboration Centre, students must either be registered by their teacher, or must have received a "Student Registration Code" from their teacher to register themselves. 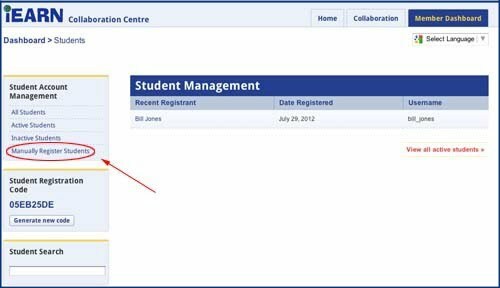 Once logged in to the iEARN Collaboration Centre, teachers can register their students in the Member Dashboard: Student Management section of the site. This section lists all active and inactive students registered under that teacher's account. 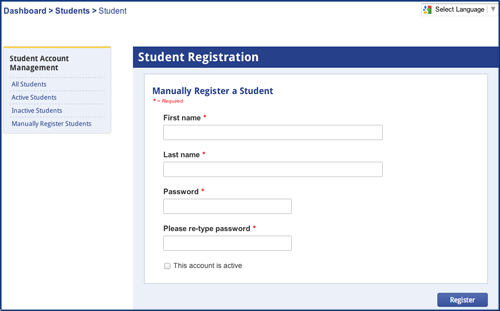 To add a new student to the system, click the Manually Register Students link shown below. On the next page (below), fill out student's first name, last name, and choose a password for the student. Take note of the student's password that you entered. It will also be shown on the screen that follows, but will not appear anywhere after the next screen (below). Be sure to keep a record of it so that you can share it with the student. It cannot be viewed again - it can only be changed. Teachers can also have students register themselves. To do so, visit the Member Dashboard: Student Management section of the site and look for your "Student Registration Code." Each teacher has a unique Student Registration Code (it can be changed at any time if needed). Copy this code, and provide it to your students. They can then visit the iEARN Collaboration Centre, click on the Sign in/Sign up link in the top right side of the page, and then click the "Students connect here" link on the next page. From here, they can enter the code provided by their teacher to be taken to a page where they can register themselves with a user name and password.